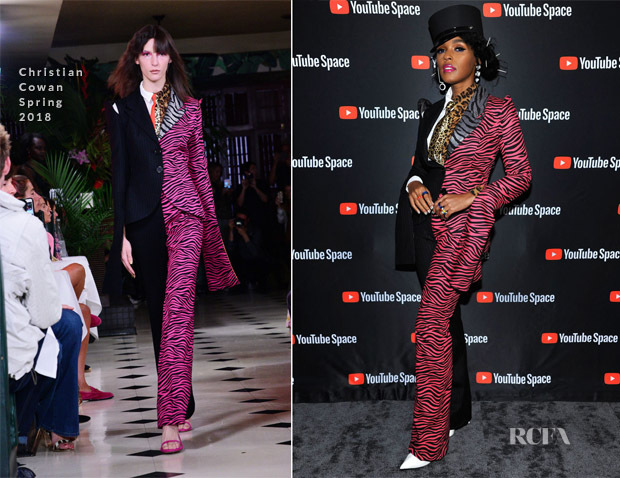 It would seem that Janelle Monae has fully emerged out of the black-and-white fashion box, as she continued to embrace the colour wheel at a special screening of her ‘Dirty Computer: An Emotion Picture by Janelle Monae’ last Friday (April 27) in LA. A look such as this Christian Cowan Spring 2018 design was made for the likes of Janelle. Indeed, she is probably the only one who could make this hybrid, costume-y design look so seamless—cool, even—given it was the Jekyll and Hyde of suits. The split personality balanced a normal, solid side with the zany, magenta-zebra side. Even if you did find the look a bit, well, over-the-top, you’d have to admit that she fully committed to its theatrical inspiration with her styling—from hat to multi-hued rings to pointy-white toe. Plus, her beauty look was on point for the outfit with the hair spikes along with a striking purple-lined eye and hot-pink lip. What do you make of her latest entrance?